Strategies behind implementation, our marketing services work with the unique position of your community. Through in-depth research and detailed implementation plans the marketing services provided by the Golden Shovel Agency are specifically tailored to increase lead generation. We live in a digital age, incorporating digital marketing to specifically target your audience is a powerful tool within Economic Development. Our digital marketing team is one of the most knowledgeable in the industry - staying on track of the latest trends and advancements we can target and engage the target audience for optimal results. Through great content and strategic execution our digital marketing services include navigating the behaviors of social media, digital presence, and positioning. Marketing has always been about connecting with your audience, in today’s world that means meeting them where they are already spending their time - online. If a tree falls in the woods did it really happen? If you have a major success and media doesn’t know, did it really happen? Media relations can be powerful in gaining support regionally and nationally - have you ever wondered how to get the most attention out of your biggest success? 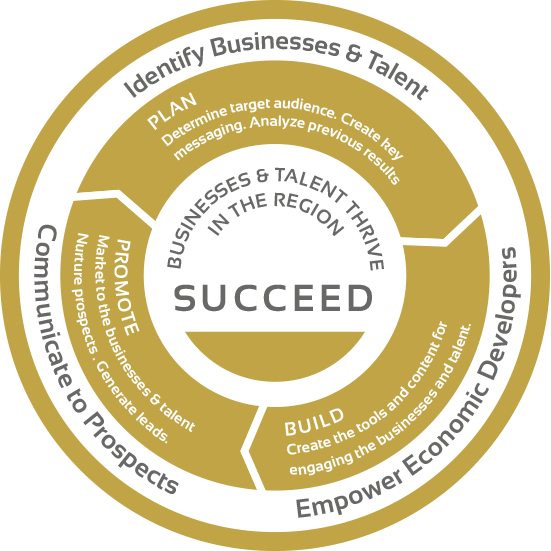 Golden Shovel has designed an exclusive Public Relations strategy for economic development organizations with an expert team of media specialists. GSA secures media coverage during major events for your community, helping to gain attention from other industry leaders and site selectors - we know what this takes from all sizes of communities and events. Our strategic marketing process takes a deep look at your community to identify strengths, target industries, and competitive advantage. Marketing strategies are unique to each community - our team identifies the key principles used to attract the key target audience and develops a strong foundation for both workforce and business attraction. How much time do you have to develop a powerful, creative strategy to bring more awareness for your community? Most economic developers already have a full plate of activities and have no time to develop and execute an awareness strategy. Crafting your brand and communicating it across various platforms is a crucial task—and can be an overwhelming endeavor. At Golden Shovel, we help you maintain a consistent presence, no matter where your brand is engaged. Our creative team can analyze your existing brand or start fresh to identify the key personality and promise you hope to convey. We’ll provide iterations of a logo, provide supporting elements, including taglines, and demonstrate the usage across a wide variety of applications (e.g., letterhead, online, collateral). Included in brand development is a style guide to create a consistent set of guidelines that can be used by others charged with building your brand presence.